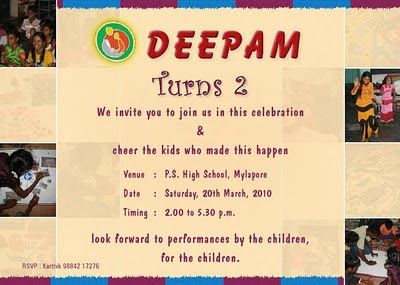 Deepam 2nd Annual Day – Tomorrow! Big day for all of us at Deepam, tomorrow. Calling everyone to come over and celebrate the day with the children ! This event is all about our children – their performances , their felicitation and the people who taught them, our volunteers !